Female much harder to ID. Throat often shows a pale pink tinge, legs are yellow instead of red and eye is only faintly red. Back and head are similar colours, white stripe on cheek is still there but not as promanent as cheek is pale white. 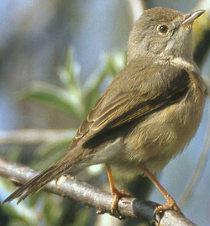 The Subalpine Warbler is easily confused with the Dartford Warbler. 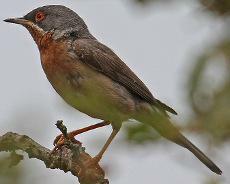 Birds found outside of known Dartford Warbler territories warrant detailed examination. The most distinctive feature is the white stripe on the birds cheek, although on the female this is less prominent due to her cheek also being a pale colour. To add further confusion the female lacks the bright red eye and legs, although if close enough it is possible to see the faint red tinge in the eye which has an outer ring of white. Open woodland, scrub and bushy pasture. Very rare vagrant to the UK where it can unexpectedly turn up almost anywhere. Breeds in the Mediterranean area and winters in North Africa and Arabia.